Bolt down, stationary design with leveling feet. Unit can be loaded at floor level with pallet jack. 38″ product discharge height with a 26” discharge projection. Container carriage pivots on a 2” diameter shaft with piloted flange bearings. Twin side mounted pivot cylinders for smooth, controlled pivot carriage rotation. 304-2b stainless steel pour hood with continuous TIG welds, ground smooth. Pour hood includes an 8” square roller slide gate with stainless steel discharge nozzle. 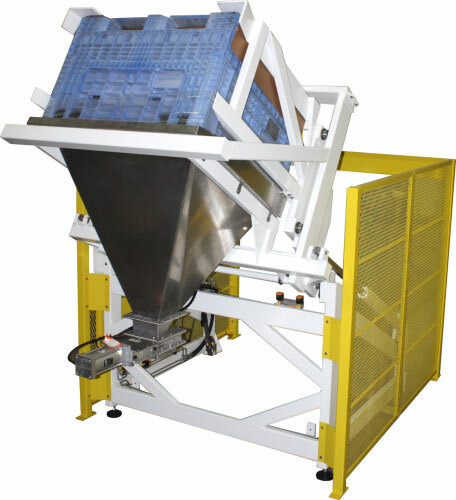 Lift & Seal™ System hydraulically seals container to the pour hood to prevent product contamination and spillage. Seal carriage features adjustable sealed cam rollers on a flat bar track for smooth, dependable operation. Expanded metal safety caging on two sides with three load side photo electric sensors for operator safety. Caging painted safety yellow. Carbon steel framework is cleaned, primed, and painted with FDA Dairy White epoxy. NEMA 4 steel electrical enclosure with momentary controls and zero-force touch button for operator safety. Parker hydraulic system with 5 GPM pump, 5 HP motor, and the MTS exclusive two-speed circuit for a smooth, controlled rotation.